This web page took four to five hours to scan, research, design, and upload. Thank you for supporting the Virtual Steam Car Museum! 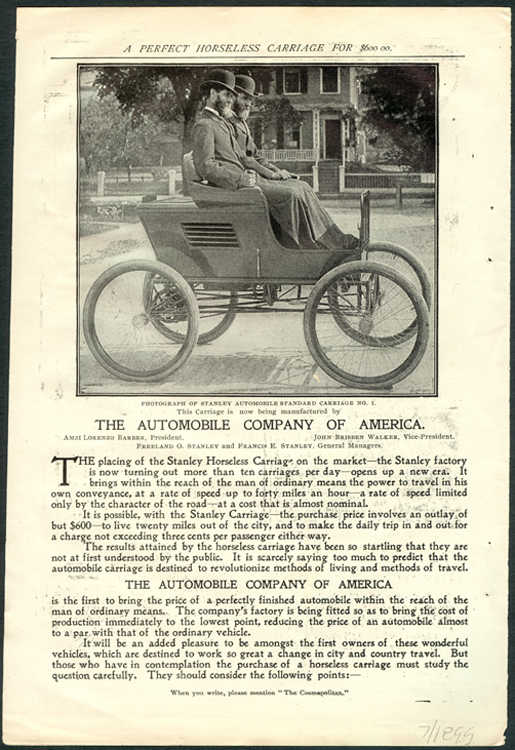 In 1899 Imzi Lorenzo Barber and John Brisben Walker purchased the Stanley vehicle and promptly named their new enterprise The Automobile Company of America. Sadly, another entrepreneur had beaten them to the name and forced them to change. 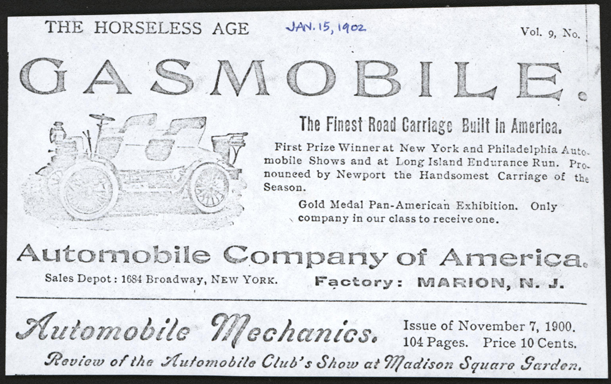 Barber and Walker chose the Locomobile Company of America, but before they did, their advertising appeared in print. This story is related in detail in Kit Foster's book, The Stanley Steamer: America's Legendary Steam Car. Every automobile enthusiast should own this book. Purchase your copy from the Stanlely Musem. This four-page advertisement appeared in Cosmopolitan Magazine in July 1899. 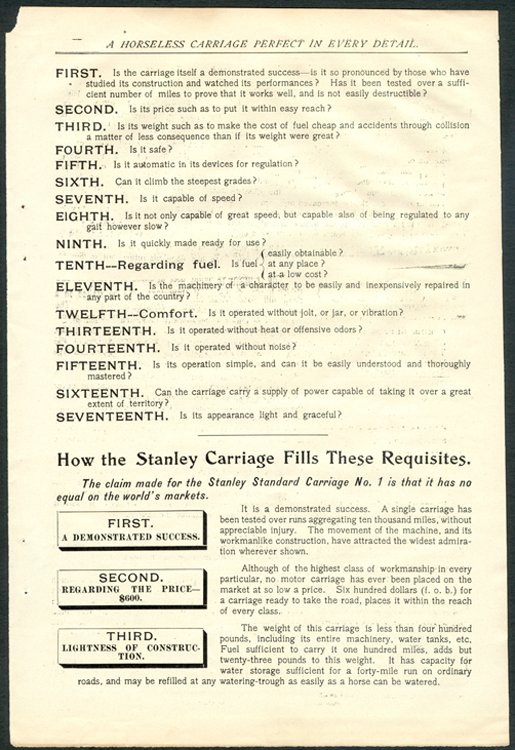 It is the first attempt to market the Stanley automobile by its New York buyers, who owned the Cosmopolitan Magazine. 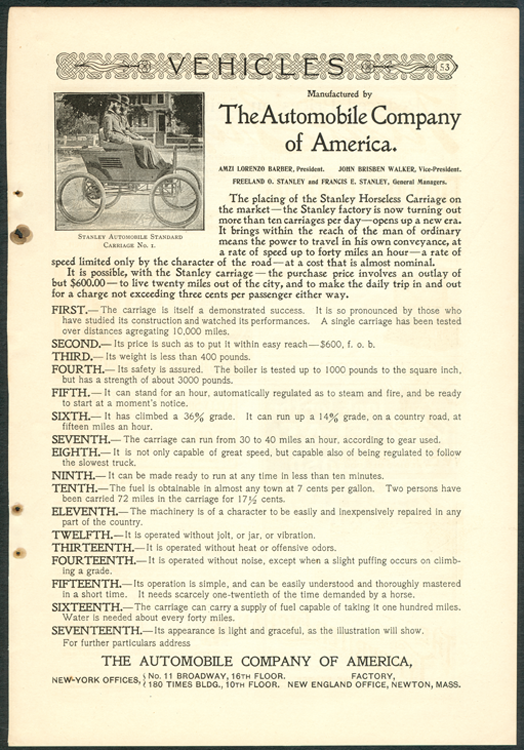 This is the single page version of the Automobile Company of America's advertisement in Century Magazine, July 1899. 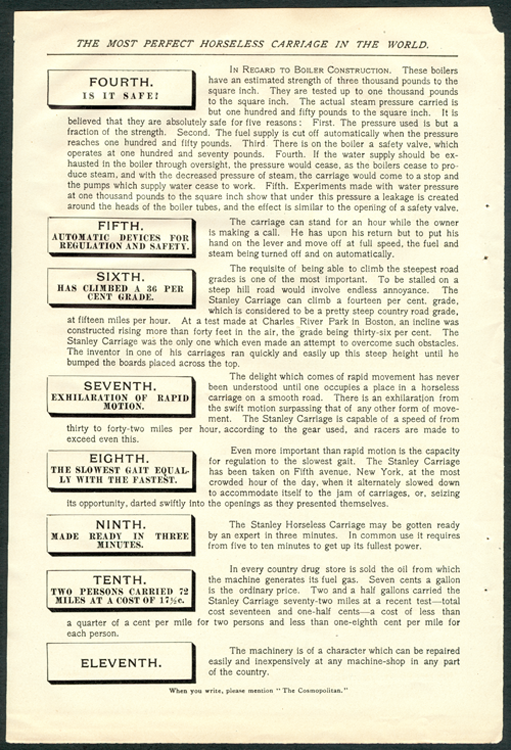 This is a single-page version of the July 1899 Cosmopolitan Magazine. Unhappily, it was not only trimmed, but its source was lost. Summer 1899. These two advertisements, each four pages long, appeared in the July and apparently September issues of Cosmopolitan Magazine. 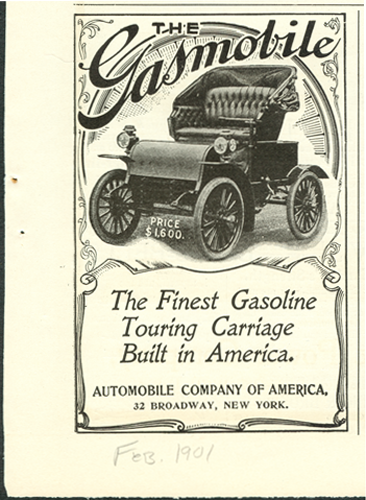 The Automobile Company of America - Gasoline Powered. 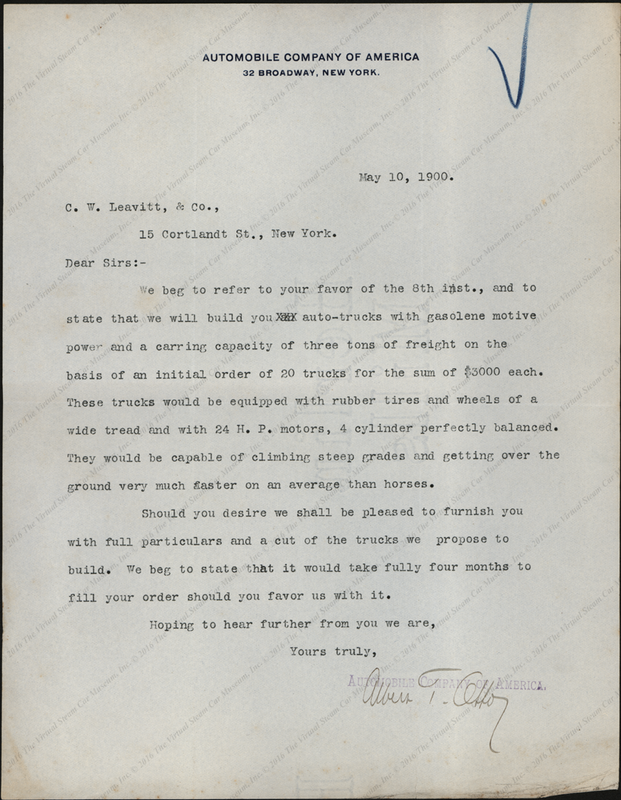 On May 10, 1900, C. W. Leavitt & Company wrote to the Automobile Company of America. In reply, the ACA sent this letter referring to its abilitiy to build gasoline powered trucks. This Horseless Age article appeared on January 17, 1900, page 65. It touted an "automatic starter." John A. Conde Collection. 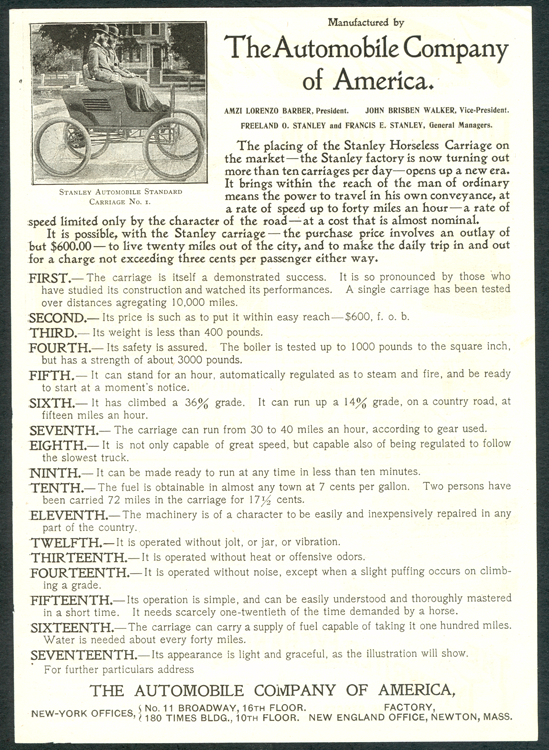 This Horseless Age advertisement appeared inside the front cover of the May 30, 1900 issue. John A. Conde Collection. 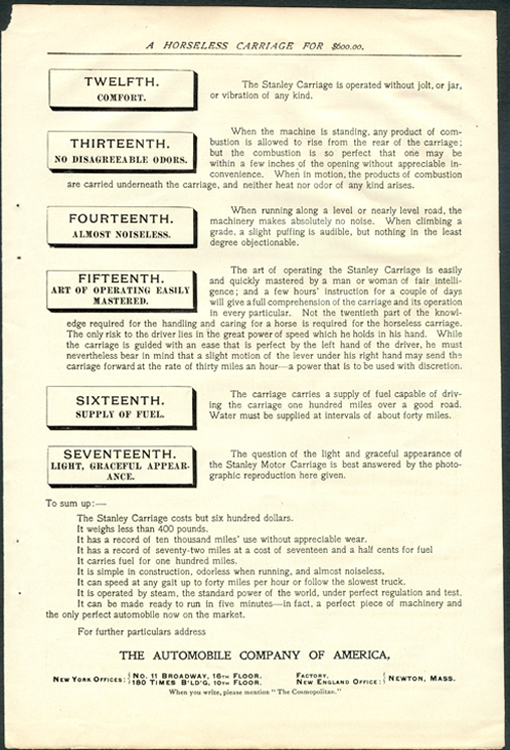 This Horseless Age advertisement appeared on August 14, 1901. 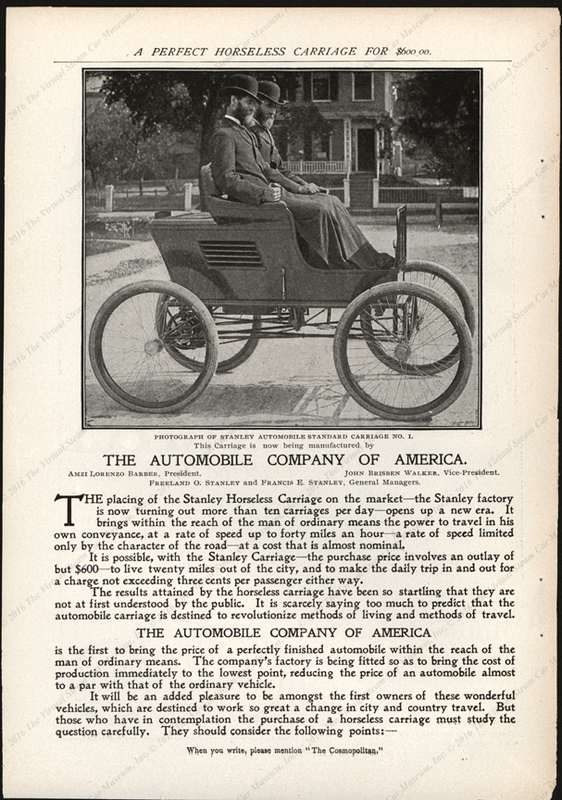 The Automobile Comppany of America was featured on sevearl pages of thhe November 19, 1900 issue of The Autombile. Figure 1 illustrates teh Gasmobile Surrey. John A. Conde Collection. This asdvertisement appeared inside the cover of The Autombile's November number. John A. Conde Collection. 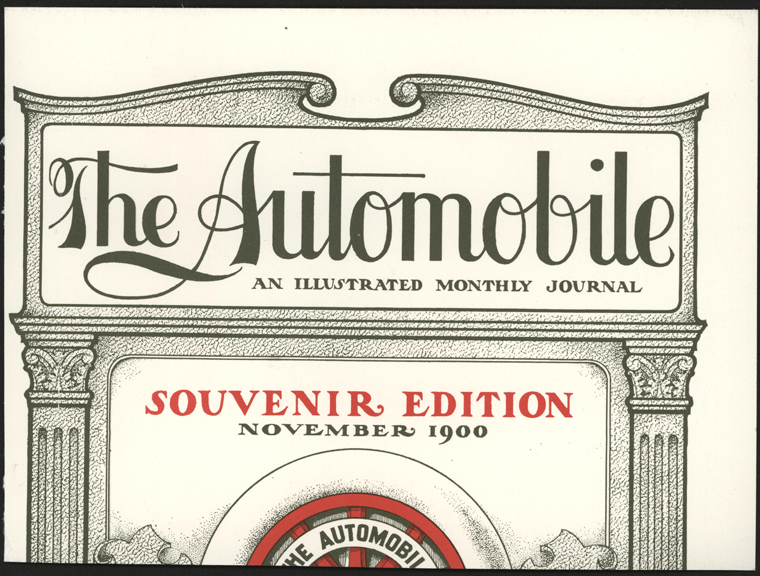 The front cover of The Autombile November 1900. John A. Conde Collection. This article described the "Gasmobile" in some detail. 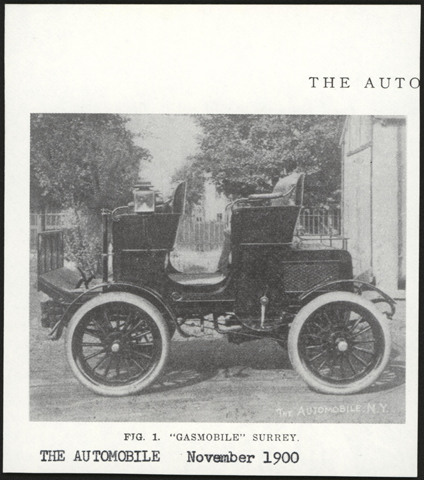 The Autombile, November 1900. John A. Conde Collection. 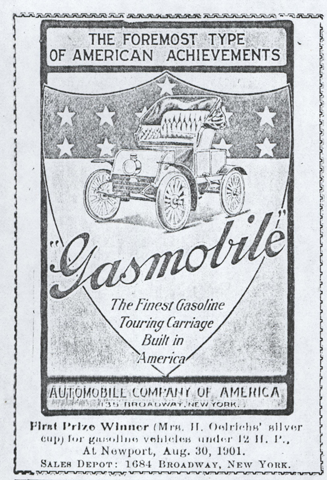 On January 2, 1902, the "Gasmobile" appeared in this Horseless Age advertisement. Photocopy. John A. Conde Collection. The "Gasmobile" won Firt Prize, "Mrs. H. Oelriehn's Silver Cup for gasoline vehicles" on August 30, 1901 at Newport, according to this January 18, 1902 advertisement in Automobile Topics. Photocopy. John A. Conde Collection. 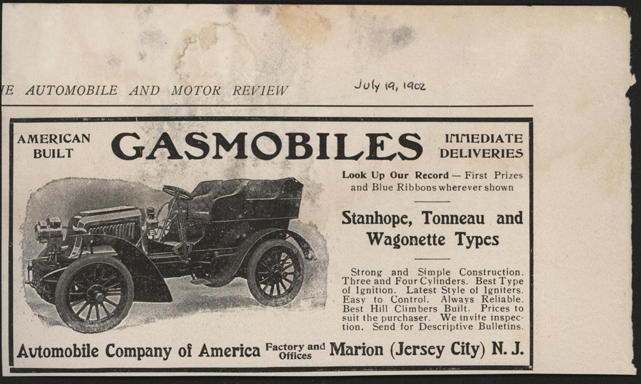 By July 19, 1902 The Automobile Company of America had increased the size and greatly altered the design of its "Gasmobiles." This advertisement appeared in Autombile and Motor Review. John A. Conde Collection. This page from Floyd Clymer's Scrapbook shows a Munsey's Magazine Advertisement. Clymer dates it as 1905, but the car show is clearly earlier. 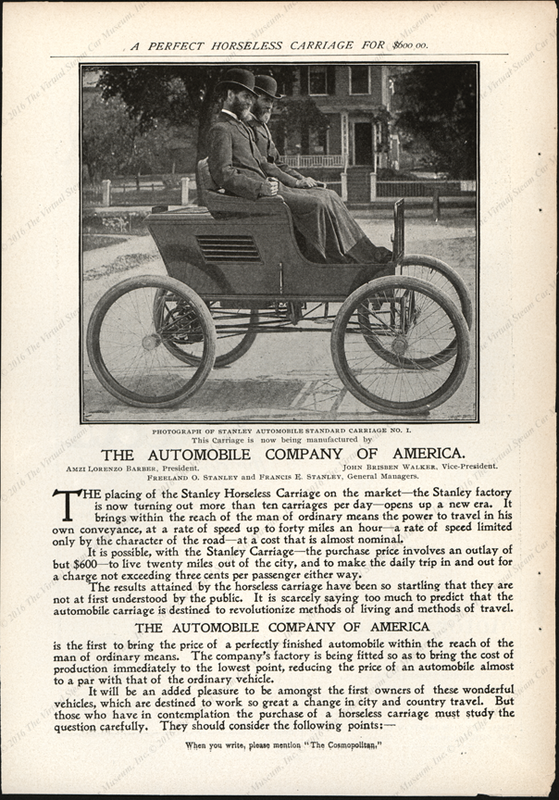 Unhappily for the buyers of the Stanley vehicle, the name Automobile Company of America was already taken, hence they were forced to change their name to the Locomobile Company of America. 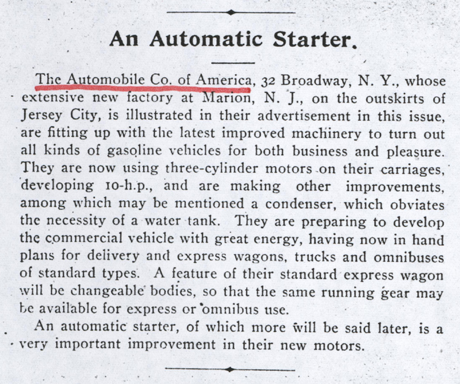 Here is an advertisement for the authentic Automobile Company of America. It appeared in Century Magazine in February 1901. 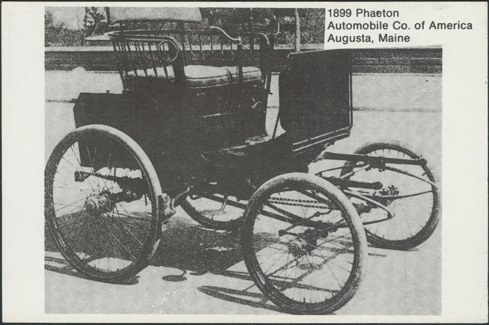 This postcard shows an 1899 Automobile Company of America Phaeton. The company is listed as being in Augusta, ME. 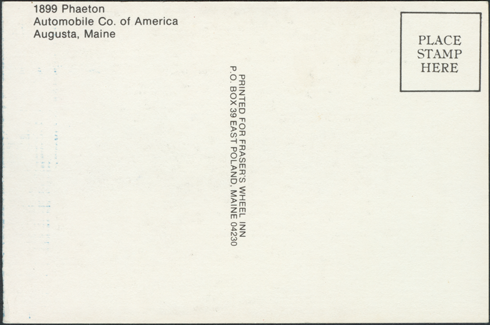 The card was printed for Fraser's Wheel Inn, located in Portland, ME. 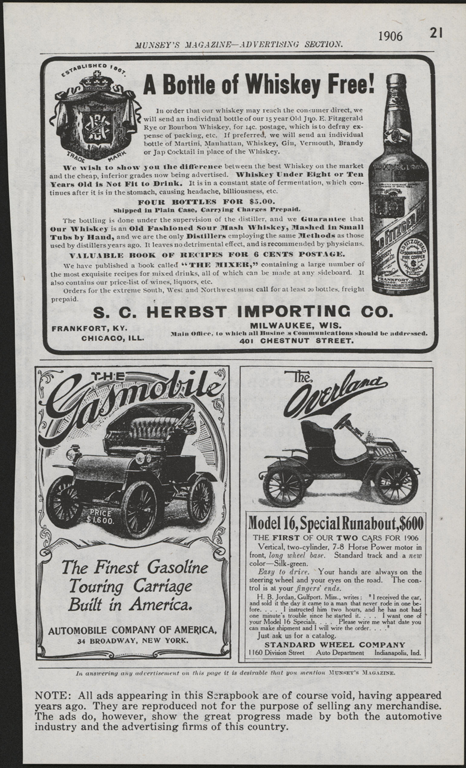 This Autombile Topics advertisement appeared on January 18, 1902, page 543. 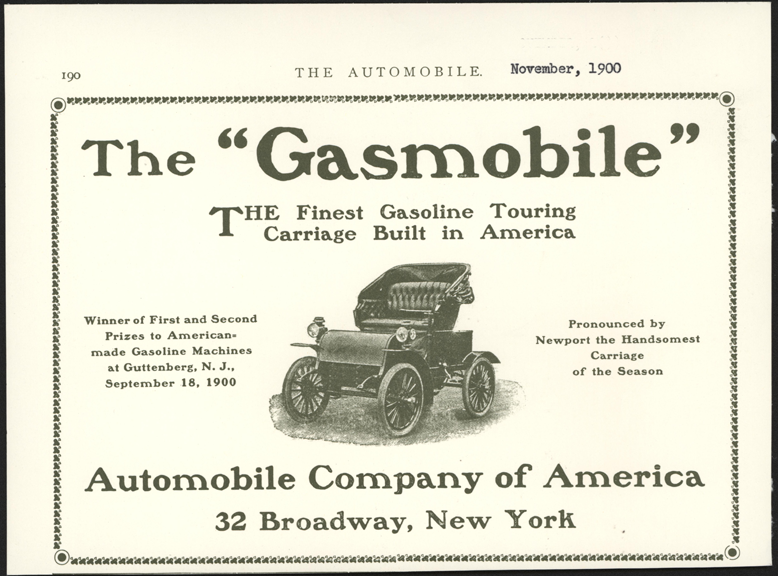 It touted the "Gasmobile" as the First Prize Winner at Newport on August 30, 1901. John A. Conde Collection. 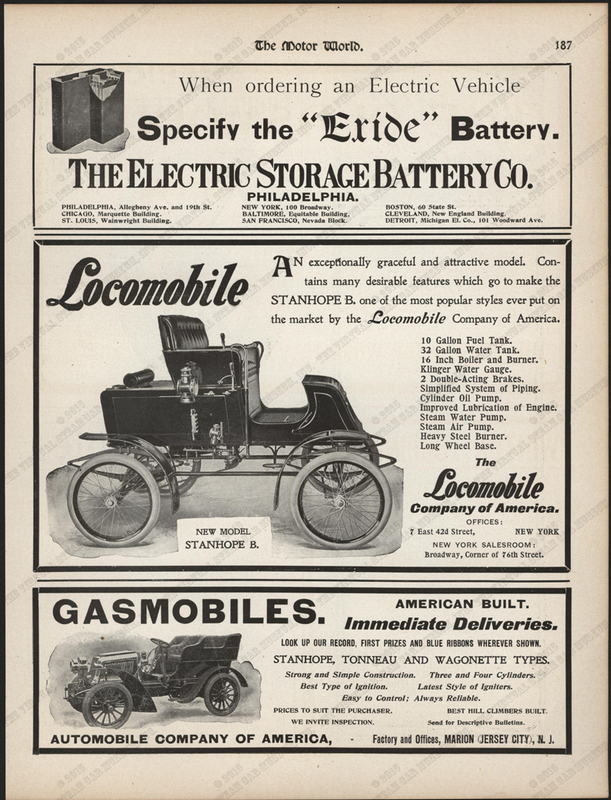 This page from Motor World, dated May 8, 1902, carries advertisements for both the Locomobile and the Automoblie Company of America. Foster, Kit, The Stanley Steamer: America's Legendary Steam Car, (The Stanlely Musem, Kingfield, ME, 2004). Contact us if you have additional information about the Automobile Company of American, or if you have questions.